"I’m very happy to announce that finally I submit the chapter for the next MVP Deep Dives Book that I’m a co-author with some other MVP professionals around the world. The book will be published next October and for sure I’ll give you here more news about it." 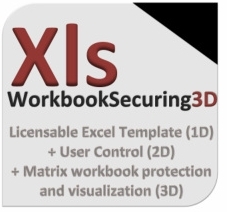 XlsWorkbookSecuring3D is a model (template) Excel editable with a three-dimensional system of protection. 1D - Anti-copy system which requires the introduction of a serial number license for each copy. 2D - Control system of users with different privileges. 3D - System of protection of workbooks and worksheets customizable for each sheet. XlsWorkbookSecuring3D is a blank Excel workbook format exe for Excel 2007/2010, where you can build your spreadsheet model simple or advanced with or without macros during a free period (trial license usually 45 days, customizable) and passed only this time the workbook opens by license activation through a serial number unique license per copy provided by us. You can use this model to develop your personal Excel projects or projects of your company or to sell their projects to others, with the assurance that they will not be copied or altered easily at least.